An "owner's manual" for every Canadian with a pension plan. Millions of Canadians are covered by pension plans in one form or another-whether that's CPP or a company plan, or personal RRSPs. But pensions are the benefit least understood by employees. They're confusing and complex, but understanding pensions is crucial to every Canadian's financial security in retirement. 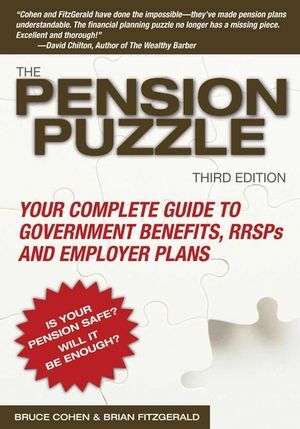 Since its initial publication, The Pension Puzzle has become the definitive book on the subject. Now completely revised and updated, The Pension Puzzle remains a true owner's manual for anyone with a pension plan. The Pension Puzzle is not just for those about to retire. It's for every working Canadian who needs to make decisions about their pension plan and how it affects their financial future. Bruce Cohen (Port Perry, ON) established himself as one of Canada's top personal finance writers when he was personal finance columnist for the Financial Post. He is a freelance writer for financial companies and the author of the bestseller, The Money Adviser. Brian FitzGerald (Toronto, ON) is a prominent actuary and expert in retirement program design and operation. He recently retired as a principal from one of Canada's leading pension and benefits consulting firms. PART ONE: THE PIECES OF THE PUZZLE. Chapter 1. How Much, How Long? Chapter 2. Are You on a Tricycle or a Bicycle? Chapter 3. Government Benefits: Cash for Life. Chapter 4. CPP: Pension Plan or Pyramid Scheme? Chapter 5. The Tax Shelter Umbrella. Chapter 6. Employer Plans: Overloaded value. Chapter 8. Your Own Plan: RRSPs, RRIFs and Annuities. Chapter 9. Will It Be STEW for You? PART TWO: THE REAL NITTY GRITTY. Chapter 10. Who Makes the Rules? Chapter 11. When Can You Join the Plan—and Who Pays How Much? Chapter 12. What Happens to the Money? Chapter 13. When Can You Retire? Chapter 14. What Do You Get in Retirement? Chapter 15. What If You're Highly Paid? Chapter 16. What Happens If You Change Jobs? Chapter 17. LIRAs, LIFs and LRIFs. Chapter 18. What about Death and Disability? Chapter 19. What Happens If Your Marriage Ends? Chapter 20. Can Your Employer Change the Plan? Appendix A: Canada's International Benefits Agreements. Appendix B: Highlights: Minimum Pension Standards. Appendix C: Who's a Spouse for Pension Purposes? Appendix E: The Actuarial Report: Keeping a DB Plan Healthy.